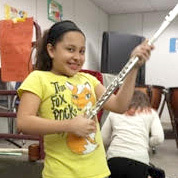 Every year dozens of third to sixth grade students in the Hudson City School District are prevented from joining school band or orchestra because neither their families nor the schools can afford to purchase instruments. TCS/NT’s Social Action Committee, led by committee chair Craig Bender, has organized a classical music concert to raise money to purchase instruments and give these children the gift of music. The concert will feature music by composers Franz Schubert, Gabriel Fauré, and Robert Schumann, played by Dan Shulman on piano, Kaori Washiyama on violin, and Beth Craig on cello. Dan Shulman is an accomplished pianist, conductor, and educator who has conducted many acclaimed American orchestras and ensembles including the St. Paul Chamber Orchestra and the Orchestra of St. Luke’s. Kaori Washiyama is the principal violin of the Kyoto Chamber Orchestra and founding director of a Japanese chamber concert series bearing her name. She is currently a faculty member at Bennington College where she teaches violin and viola. Beth Craig, cellist, performs with the Berkshire Chamber Players and in a jazz duo. She has previously performed as a member of orchestras in Sao Paulo, Brazil, Florida and Ohio. She teaches cello at Berkshire Music School and Berkshire Country Day School.